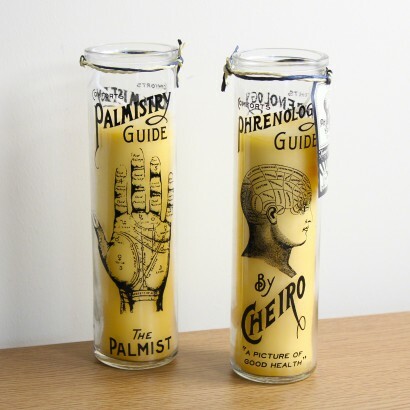 Standing tall in thick glass jars that are decorated with vintage phrenology and palmistry images, these tall wax candles bring charm and a certain kind of mysticism into your home with the palmistry candle in particular lending a vintage carnival vibe. The old medical images on the glass jars make these unscented candles more interesting than your average candle jar which protects the flame as the candle burns down. The size of the inner candle means that you get a good long burn from each pillar, that gives a warm hypnotic glow as the candle burns whilst the left over jars can be used as statement vases once the candle is all burned out. Plenty of choice, chose these items for a friend's birthday, she was delighted. They arrived on time and were packaged extremely well. Can't fault them and would definitely use this company again. I love these candles so much. I am so happy I found them. What was even better was the fantastic service I received from the company. Great price fast delivery well packaged. Could not ask for more. Thank you. Really pleased that I bought these, they look great in my living room. Quick delivery, great service! I've been looking for these candles everywhere for a decent price and these have definitely been the most inexpensive! The team are so quick to respond and gave me an accurate time for when they would be in stock again. I love how these come in a 2 pack and the products themselves are amazing and were well packaged. The delivery was also very very speedy. 10/10 for service!